Definition of Bio fertilizer: a bio fertilizer is an organic product, which contains different types of micro organism in the concentrated form, they are able to fixation of atmospheric nitrogen, symbiotically or non symbiotically. Fertilizers of biological origin are called bio fertilizer. Bio fertilizers s a 100% natural and organic fertilizer that help to provide and keep in the soil all the nutrients and microorganisms required for the benefits of the plants. Most of the bio fertilizers add nitrogen to the soil. Bio fertilizers are of three types: Nitrogen fixing bacteria, nitrogen fixing cyano bacteria (blue green algae) and mycorrhiza. 1. 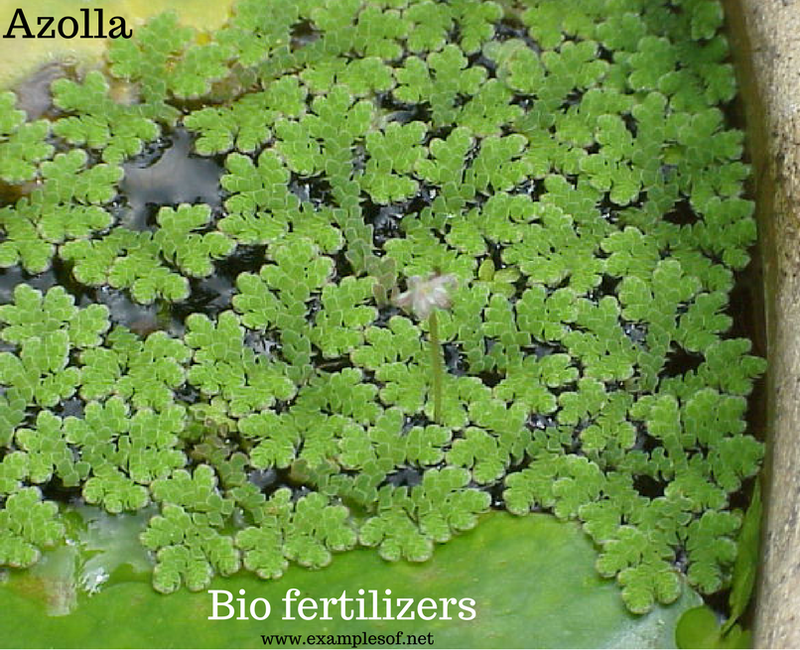 Azolla is a floating fern which harbours a blue green algae in its leaf cavities. 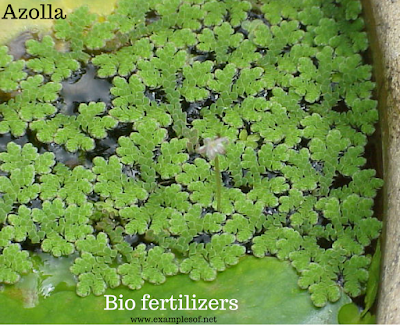 Azolla supplies nitrogen, increases physico chemical properties of soil such as soil structure, texture, water holding capacity, cation exchange capacity and pH by providing several nutrients and sufficient organic matter. 2. Azospirillum are nitrogen fixing bacteria that lives in a symbiotic relationship in the root cortex of several tropical crops. 3. Azotobacter are free living nitrogen fixing bacteria and are know to produce several plant growth promoting substances. Azotobacter and Azosprillium, besides supplying nitrogen to soil, secrete antibiotics which act as pesticides. 4. Rhizobium bacteria, basically form root nodules in leguminous plants and fix atmospheric nitrogen in a symbiotic association. 5. Sesbania: It is a green manure plant which plant which forms both root and stem nodules in association with Rhozobium and thereby fixes more atmospheric nitrogen. 6. Phosphate Solubilizing Microbes / Bacteria: They soluble the insoluble phosphorus. Bacteria like Pseudomonas striata and Bacillus megaterium are also important phosphorus solubilising soil microorganisms. Many fungi like Aspergillus and Pencillium are potential solubilizers of bound phosphates. 8. Symbiotic nitrogen fixing cyanobacteria: Azolla - Anabaena association is of great importance to agriculture. 10. VAM (Vasicular Arbuscular Mycorrhizae) : The VAM act as a symbiotic association between agriculture plant root and fungal mycelia. VAM increase the uptake of phosphorus and even uptake of phosphorus and even uptake of Cu, Zn, Mn and Fe.